When you think of local engagement and wedding ring traditions, what comes to mind? A man spends 3 months of his paycheck on the perfect diamond studded engagement ring, gets down on one knee, puts the engagement ring on his future bride’s ring finger on her left hand. Once they wed, the wedding ring goes on the side close to the inner hand – “closer to the heart” -while the engagement ring goes closer to the finger tips – “closer to the wallet” – both remain on the left hands ring finger. The man traditionally goes for a more plain and less elegant wedding ring, worn on the same hand and finger as his bride – and men typically aren’t seen in engagement rings. Would it shock you if I said that not everyone does things this way? Because they don’t. Below, we have compiled a list of unique and interesting engagement and wedding ring traditions from around the globe. Some traditions include men in the luxury of wearing engagement rings. Couples in Brazil and Chile, for example, both wear a ring during the period of engagement – this plain is worn on the right ring finger, and is moved to the left at the time of marriage. Engagement Rings are worn on the right hand in many European countries as well, including Germany and Norway! Though female to male proposals are becoming more common in today’s society, the British have a tradition that addresses this – in the British Isles, if a woman wants to propose to her significant other, she can do so….on leap year! Argentinians, in a sense, follow the steps of Brazil and Chile by utilizing only one ring – that is, the engagement ring. In Argentina, the engagement ring is repurposed as a wedding ring following the marriage of two individuals. In terms of engagement rings, some traditions opt to use alternatives to diamonds. 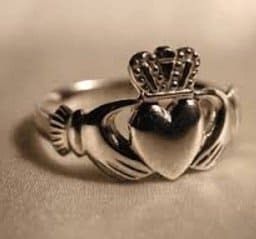 The Irish, for example, are known to opt in to using a Claddagh ring as an engagement ring, while the French have a preference for gemstones! Other traditions nix the tradition of engagement rings all together and prefer other styles of jewelry in their stead. In West Bengal, the brides receive bracelets, fittingly called bangles, in lieu of the traditional engagement ring while in Kenya, intricately beaded jewelry is the common means of proposal. Moreover, some traditions nix the common tradition of exchanging or gifting jewelry as a means of proposal altogether! In China, for example, a suiter might give his future wife valuable objects or money instead of an engagement ring. Swedish brides get three rings – the engagement ring, the wedding ring, and the ring of motherhood. The ring of motherhood can be worn from the date of marriage to symbolize fertility, or alternatively, can be worn after child bearing to symbolize motherhood. A Jewish husband might slip his bride’s wedding ring onto her index finger – this happens because it is the mostly used. Many Jewish brides will then choose whether or not it is in their interest to move it to the more modern ring finger. There are undoubtedly hundred, if not thousands, of engagement and wedding ring traditions and cultural customs that we missed, but despite that, the diamond studded engagement ring and wedding band on the ring finger of the left hand is still the most customary practice, accounting for the choice of preference of 70% newlyweds worldwide and, as a result, it is no surprise that it is the look with which we are most acquainted with today. If you have a time please rate this essay writing services, thank you.